© Dedalus Foundation, Inc/Licensed by VAGA, New York, NY. Photograph by R.H. Hensleigh. The art of Robert Motherwell is distinguished by subjects both tragic and lyrical, a temperament alternately ascetic and sensual, and compositions by turns monumental or intimate. Motherwell studied philosophy at Stanford (B.A.1937) and at Harvard University. Settling in New York in 1939, he continued his studies at Columbia University and became acquainted with Willem de Kooning, Adolph Gottlieb, Jackson Pollock, and Mark Rothko, all influential members of the first generation of Abstract Expressionist painters. His academic background and literary skills prompted him to organize forums, symposia, and panel discussions, as well as write and lecture to promulgate and clarify the principles of the new abstract painting being produced in the 1950s. 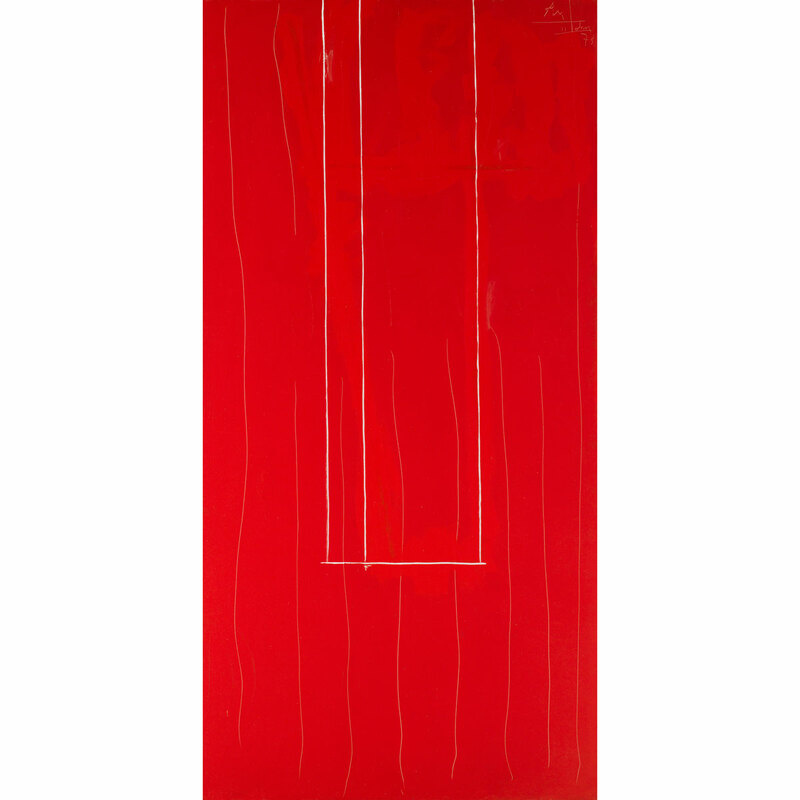 Red Open #3 is a signature work from Motherwell’s Open series of paintings which he initiated in 1967. Painted a vibrant crimson red, it towers seven feet in height. Its rich red field is animated by a white-outlined “window,” several incised, undulating “strings” or “threads,” and a pale but discernible Je t’aime (I love you) handwritten across the surface at the work’s center. The symmetrical placement of the white “window” is offset both by the double white verticals of its left side and the freehand drawing of its outline. This rectangular opening is countered by the eight faint but sensuously wavering elements that flow down the red field. The confidential declaration, “I love you,” might be interpreted as a reiteration of the “openness” Motherwell sought to convey in this body of work. Indeed, the Open paintings, proffering an entree into “an airy, rising world,” complement Motherwell’s preceding series, the dark, brooding Elegies to the Spanish Republic begun in 1948-49. He also shares with Matisse a fascination with the inside/ outside theme of the window. Motherwell’s earliest works bear such titles as Spanish Picture with Window (1941) and Spanish Prison Window (1943-44).The structural clarity of the Open canvases may owe something as well to the spare Minimalist aesthetic of the 1960s, though their emphatically hand-wrought character discloses a divergent sensibility. Motherwell returned to the Elegies and Open series at different times throughout his career. They mark the two poles, elegiac and celebratory, of his oeuvre. Common to both, however, was the artist’s engagement with the socio-political forces of each decade, from the existential doubt and indecision of the post-World War II era to the optimistic, youth-driven social revolution of the 1960s. Within these “large simplifications,” as the artist referred to them—the Elegies that embodied the fears of the 50s and the Open paintings that embraced the hopes of the 60s—Motherwell conceived an extraordinary range of compositions varying widely in mood and expression. The format of the works in the Open cycle, for instance, included both horizontal and vertical versions, the window motif inscribed in charcoal or paint, and its rectangle-within-a­ rectangle configuration ranging to infinitely varying proportions. Backgrounds, sensuous in hue and brushwork, might be the ripe, voluptuous crimson of Red Open #3 in the Shuey Collection or dusky grays, Mediterranean blues, or earthy ochres. They are muralistic declarations of the exhilaration of open-ended possibilities.